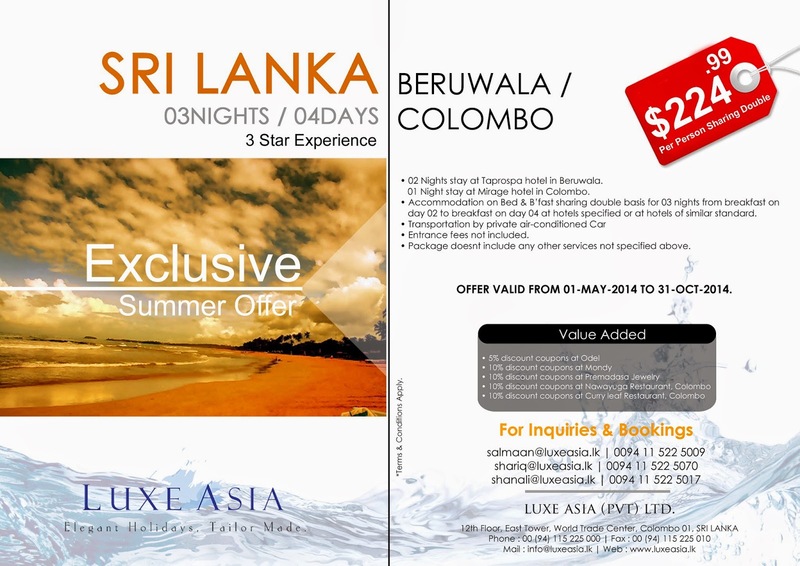 Special Summer 03 Nights/04 Days package of Sri Lanka for the Middle East and Asian Markets. The package valid from 01st May – 31st October 2014. You will be met on arrival at the Bandaranaike International Airport by our LUXE ASIA representative who will assist you with your luggage and guide you to your vehicle where your personal chauffeur guide awaits. Transfer from Colombo to Beruwala. Spend your time at leisure on Sri Lanka’s beautiful coastline at Beruwela, where there are fine beaches and many things to do. You can relax on the beach or go for a walk to some of the local fishing villages. Transfer from Beruwela to Colombo. Breakfast at the hotel in Colombo. Accommodation at the above mentioned hotels on Bed & Breakfast Basis commencing from the Breakfast of the day 02 ending up with the breakfast on day 04. Services of a English speaking chauffer guide.